Editor’s note: I always appreciate hearing stories about players who came back to the game and have recaptured their youth. 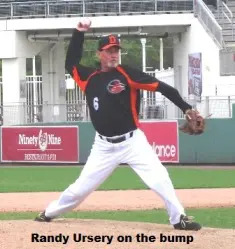 Randy Ursery lives in Tennessee and recently sent a short note outlining his return to the diamond. His words are captured below. Thanks, Randy! “My story is completely different. Growing up I never had the opportunity to play the game of baseball. But in 2013 at the age of 53 I fulfilled an item on my bucket list and went to the St Louis Cardinals fantasy camp. I played seven games and fell in love. I then came home and looked for somewhere to play. Th at’s when I found out about MSBL. P.S. My wife loves the game as well and my being able to play. I have two championship rings so far and look forward to hopefully a few more before I hang them up.